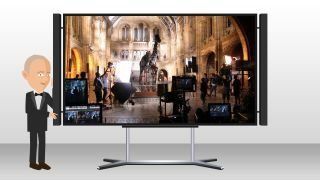 Sky, BBC and 4K: is British TV turning its back on the Ultra HD revolution? Is 4K the natural evolution for TV? TV broadcast history was made at the 2014 BAFTA TV awards this week as David Attenborough's Natural History Museum Alive 3D became the first UK all-4K TV show to win a British Academy Award. Produced by Colossus Productions, a partnership set up between Sky 3D and Atlantic Productions, it features everyone's favourite natural history broadcaster interacting with extinct dodos and dinosaurs. You'd be hard pressed to find a better analogy for TV's technology evolution. What makes Alive particularly remarkable is that the entire production was produced in 4K, including the visual effects. Given that even the largest Hollywood blockbusters typically render VFX at 2K, even when live action is lensed at a higher resolution, the project was nothing if not ambitious. "It was conceived as a full 4K film for delivery in 4K," says Anthony Geffen, executive producer on the project. "There's no point going into a medium like this and not delivering something different. A lot of people are doing bits and pieces in 4K, but a film like this has a huge number of special effects shots, almost comparable to a feature film." Tellingly the 4K production wasn't just a technical challenge. "3D programme making like this is very complicated in terms of funding," says Geffen. His ingenious solution has been to make shows that play well on both the smallest screens and the largest. "Luckily our films have done really well at IMAX theatres and that kind of makes them doable," he says. This business model has also made 4K a must. "I think it would be very hard to convince a broadcaster to go to that kind of resolution in the current environment unless you had an outlet like IMAX. I suspect Sky would have said it was all getting too expensive. It's a double edged sword though. As we know we're going to IMAX, we're getting even more ambitious." "With rising competition, the people who push the buttons are very reluctant to do 4K." So will Alive's critical and commercial success hasten a new broadcast era of 2160p telly? Don't bank on it. Geffen is disappointingly skeptical. Despite his enthusiasm, he says the wider TV industry remains ice-age cool on 4K, an attitude that could potentially scupper the nascent technology. "It's a bit like 3D. We've got to be careful that 4K doesn't get a bad reputation because there isn't any content. The broadcast industry has bunkered down if you want my honest opinion. "With rising competition, the people who push the buttons are very reluctant to do 4K. Things are starting to get out of kilter. Companies like Sony are throwing a huge amount of money behind 4K for consumers, but they may have a bit of trouble if they're not careful. Why should people chuck out their lovely HD sets in order to get another which costs double the amount, when there isn't much 4K content available?" Geffen reveals that he's currently working on an as yet unannounced series for the BBC which is also being shot 4K, however he confirms that the funding to shoot in Ultra HD hasn't come from the Beeb. "I'm also making a series for the BBC in 4K, but only because I've found the extra funding myself to do that…the BBC won't show it in 4K… this is the world we're in right now. The BBC isn't yet into the mode where they have the money for very much 4K." So is tight-belted conservatism in danger of holding back the broadcast industry? "I think the BBC is a big enough institution to be playing around in the 4K space. I think they should embrace it. Personally I think it was a mistake for the BBC to pull out of 3D, but not just because of 3D. If you don't have people looking at those kind of mediums when you have billion pound budgets, you're going to lose out somewhere down the road." Geffen goes further, suggesting that it's now Sky taking the broadcast technology high road. "The investment that they have put into 3D and subsequently 4K, is enormous. Sky is now doing what the BBC once did some time ago." So how long will it before before Sky broadcasts Alive in all its 4K glory? Geffen doesn't know. "All the broadcasters are keeping their plans close to their chest," he admits. "I'm sure though at some point 4K will come to Sky, because they're all about customer desire. However at the moment Netflix and other internet delivered outlets are beating everyone else to it."